After researching the Pryor family of Washington and Frederick counties for a playful Pryor group portrait awhile ago, I was primed to respond when I saw this cabinet card portrait come up for sale on an internet auction site. An inscription on the back in period ink identifies the sitter as “Mr. J. Walter Pryor, Wolfsville, Fred. Co., Md., Oct. 17th, ’95”. 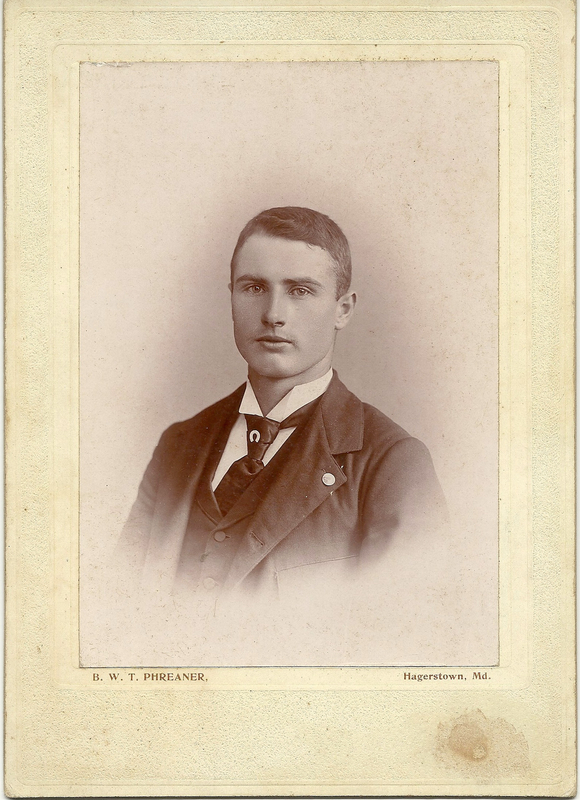 Based on what I have learned about the Pryors, I believe this young man was James Walter Pryor (1874-1965) the son of Frederick County farmers Peter Columbus Pryor (1853-1925) and Catherine Sensenbaugh (1851-1929). Both James Walter Pryor and the Pryor boys in my other card photograph trace their ancestors to “Reds” Elliot (1760-ca. 1810-1820) and common-law wife Hannah Prior/Pryor (1760-1839). Both are believed by family history researchers to have emigrated from the British Isles and to have had 11 children together. Known as J. Walter Pryor, perhaps to distinguish himself from cousin James Albert Pryor (1872-1919), our subject in 1902 married Olive Idella Wolfe, daughter of a neighboring Wolfsville, Frederick County farmer and carpenter Jonathan N. Wolfe (1843-1918) and Amanda Blickenstaff (1844-1895). The couple settled in Hagerstown, where J. Walter followed a variety of occupations. He worked as a bleacher in a knitting mill, and as a foreman for the Maryland Pressed Steel Company. In his later years he worked as a carpenter and a painting contractor. He and Olive raised their seven children first in a brick duplex at 202 Cannon Avenue and later in a wood-frame house on North Mulberry Street. It wasn’t until 1946 that he was appointed, by a narrow margin, master of the Hagerstown City Market, a position he held until 1954. In the announcement of his retirement at the age of 80, the Hagerstown Morning Herald said that he “was considered by many the best market master the city had ever had, “doubling the number of rented market stalls” and carrying out much-needed repairs and refurbishment to the building and fixtures (Hagerstown Morning Herald, 31 December 1954, p. 12). Those who are familiar with Hagerstown history know that the City Market House, since 1928 located at 25 W. Church Street, has been a center economic and social life in the county for over two hundred years, surviving the rise of supermarkets and international food distribution. J. Walter sat for this bust portrait at the studio of Bascom W. T. Phreaner (1845-1932), who operated a photographic gallery in Hagerstown from 1866 to 1901. Phreaner used a traditional burned-out background to highlight the simple dignity of the young man’s clear-eyed gaze. Pryor chose a 5″x7″ cream card mount with a subtle pebbled texture. James Walter Pryor and Olive Idella Wolfe Pryor are buried at Rose Hill Cemetery, Hagerstown. Peter Columbus Pryor and Catherine Sensenbaugh Pryor are buried in the cemetery adjoining St. Mark’s Lutheran Church, Wolfsville. Thanks to the many family history researchers and volunteers who have documented the Pryors of Hagertown and Frederick County. How can I get permission to reprint a photograph from your excellent collection? In particular I’m interested in F. J. S. Gorgas, MD, DDS. Hi Brent . . . If you email me at waldonia2000@gmail.com we can discuss it.